The Department of Human Resources believes that all employees contribute to the overall success of the University. Our department facilitates awards and programs that acknowledge those who are committed to their work at UA. It’s our mission to support the faculty and staff in their pursuit of excellence in teaching, research and service. In order to meet our mission, we assist in efforts to retain exceptional employees and to create an environment where all employees feel appreciated for their contributions and are motivated to continue their hard work. The Department of Human Resources aids in the process of giving accolades to individual employees, departments and teams for their exemplary performance, winning spirit, exceptional customer service and enterprising ways. Each year, HR recognizes employees for their years of service at the annual Service Anniversary Reception, and also coordinates the Capstone Awards. 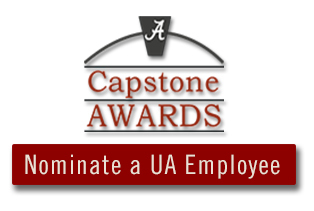 The Capstone Awards are five distinct awards created in honor of five outstanding individuals who served the University in their own, unique way. These awards continue their legacy by honoring current employees who demonstrate similar leadership, excellence and commitment to service.